How to impress employers is the question to answer today, but the answer is the same as yesterday’s: Find their need, then be the one to meet the need . If you do, then you have a right to have a mutual excitement about whom you partner. Part of the challenge is that most job seekers are still co-dependent on job boards, bracing themselves for interrogation during the interview process, and hoping to get picked. What’s unfortunate is waiting to be chosen, often by the company, as if it were the NFL draft. Many will even go with the company that’s the wrong fit for them. Instead of being the shepherd of their career, they settle for being the hired hand. They do enough to say they did something. It’s an intrinsic battle we have at least once during our careers. I have done it when I needed the check. It’s not the worst decision ever, but unfortunately, for some, it’s the only way to navigate career moves. Resilience is a powerful attribute to show. If you’re telling your story online, part of it must explain how you navigate challenges and overcome fears. Show how you create workarounds without complaining about obstacles. You can also show how you weather online criticism and how you create solutions to silence the noise. It’s tough to do, but it’s doable. Showing you can work with different types of thinking and people from various backgrounds demonstrates communication skills. You will also notice your networking opportunities will open global possibilities. Engaging conversations with the diversity of thought also helps you hone your craft. What you say is not nearly as important as how you say it. It is creating an engaging learning environment for your network and readers of your website. Good personal trainers assess your physical movement before prescribing exercises. They will not offer training to weaken a weak body part even if the exercise strengthens the muscle. The trainer may defer to your doctor for further tests or a physical therapist who knows how to rehabilitate the weak muscle. In the same way, the consultant mindset tests to see where the source of the problem is. If there are several things, you may need an additional consultant. Depending on your industry, kicking and screaming when there is new technology to learn is not a good thing. Companies are spending millions to make work life and profit easier, faster, and better. You must demonstrate enthusiasm and the ability to toggle between various forms of technology. You add value if you can show others how to make the transition too. Don’t ever underestimate the power of audio and video. When using these mediums as storytelling tools, you can ensure ways to be memorable. Creating or being a guest on a podcast, radio, video, or television show changes how you are remembered and valued. Video can help you reach employers in many ways, and you can optimize its use on Facebook (Facebook Live) and Instagram (Instagram Stories). Recruiters and employers actively use both, and there is a growing use of Instagram by showing their culture and employees as brand ambassadors. In addition to using YouTube, Zoom, a video software for video conferences and online meetings, can be a tool to create value for an audience of industry peers and colleagues. All of this can transfer to interviewing for jobs with companies that use it in the first part of their interview process. Your resume needs more than accomplishments and results to stand out in a very competitive job market. Blogs, vlogs, and podcasts are slowly growing as a way for job seekers to demonstrate expertise. A recent article on JobMob.co.il shows 17 examples of people who found creative and bold ideas to present their credentials to target employers. When it didn’t work for the original target employer, it helped her stand out to other companies like the intended employer. It takes time at the beginning of your job search to find out what employers want. Since so many job candidates don’t have anything online employers want to see, for you, it’s where you want to lead them. Business cards, word-of-mouth, and maybe a QR code on your phone are great ways to have people you network with or potential referrers find you easily. Even LinkedIn has a new feature, providing a QR code, and those who scan it will go to the user’s profile. So many people do not put the consistency and the thought to build an impressive online presence either. Consider this advice an opportunity to make it easy and insightful for employers to find you, and at times, discover you before you know they are looking. How to stand out to employers online is frequent question and subject for job seekers. It’s one of the hardest things to do on the Internet since there is so much noise competing to be heard. The day has come to show how you add value to employers, peers, and prospective connections online. There are job seekers who want to be noticed but not sure how they can be heard. 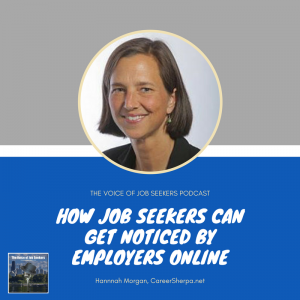 I bought Hanna Morgan back on the show to discuss how to appeal to employers online. Hannah Morgan, the founder of CareerSherpa.net where she provides legendary advice on job search, personal branding, and online visibility and reputation management. She also writes about careers for U.S. News and World Report. Is what I am saying resonating with employers? 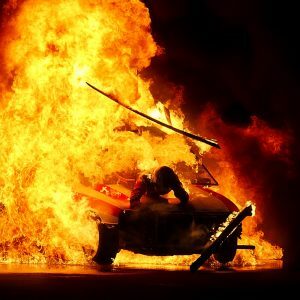 The airport test: Can I see myself stranded with this person? Is getting attention means getting hired? I am here for you! Use my contact information above to inquire about individual or group coaching. You can also sign up for my weekly newsletter at the top right of my page. I try to pack as much value in my newsletter to more than 2,000 subscribers as possible. Grab my updated “118 Job Search Tips for the Modern Job Search in 2018” here. Still conflicted with building your brand online. Have you tried defensive googling, yet? Concerned the data or the lack of data about you on Google it’s vital to your job search? Did you know the 40-hour work week is obsolete? We address all three of these questions in today’s episode. We have two segments today I hope will improve your career. You’ll learn more about finding yourself and strengths can guide you to positive career outcomes. You should also stop looking for a 40-hour job. More on this in the show. Finally, You’ll also learn practical steps in using Google to correct, protect, and build your online presence to make yourself attracted to employers. Susan is the founder and a pioneer in the online job advice space. She is the founder of job-hunt.org and is an online job search expert. Susan also owns WorkCoachCafe.com. Both are Forbes 100 Best Career Sites. She is also a Personal SEO Researcher and Writer and writes for the Huffington Post and Forbes. 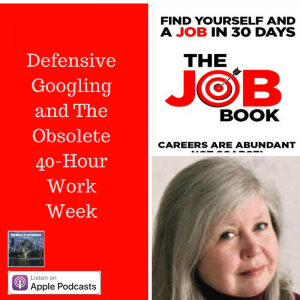 I want you to hear what Susan Joyce and I talked about Defensive Googling. I invite you to listen to the conversation, then go practice what we discussed. It could be the difference between knowing your value as a job candidate and not knowing why you’re getting rejected. The second conversation is with Diane Phillips who is the co-author of The Job Book: Find Yourself and a Job in 30 Days. She has more than three decades of experience spanning the globe that includes working with Fortune 100 executives and corporations, Nobel Prize winners, radio and TV programming and production, school curriculum development and author. Expert in personal and professional development of executive leaders and their teams, driving impactful outcomes and systematic solutions. Do you need coaching or instruction? I am here for it! Use my contact information above to inquire about individual or group coaching. You can also sign up for my weekly newsletter at the top right of my page. I try to pack as much value in my newsletter to more than 1,100 people as possible. If you want to see an example of what I send out, go here.